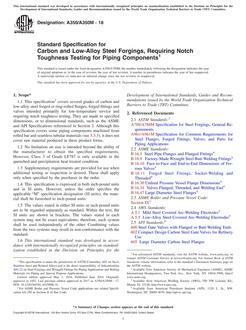 1.1 This specification covers grades of nominal-wall-thickness, stainless steel tubing for general corrosion-resisting and low- or high-temperature service, as designated in . 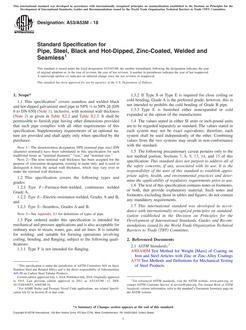 Note 1--When the impact test criterion for a low-temperature service would be 15 ft-lbf (20 J) energy absorption or 15 mils lateral expansion, some of the austenitic stainless steel grades covered by this specification are accepted by certain pressure vessel or piping codes without the necessity of making the actual test. For example, Grades 304, 304L, and 347 are accepted by the ASME Pressure Vessel Code, Section VIII Division 1, and by ANSI B31.3, for service at temperatures as low as 425oF (254oC) without qualification by impact tests. Other AISI stainless steel grades are usually accepted for service temperatures as low as 325oF (198oC) without impact testing. Impact testing may, under certain circumstances, be required. 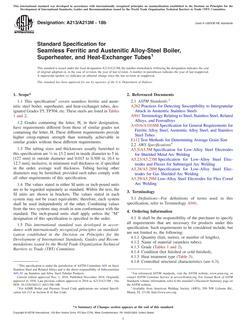 For example, materials with chromium or nickel content outside the AISI ranges, and for material with carbon content exceeding 0.10 %, are required to be impact tested under the rules of ASME Section VIII Division 1 when services temperatures are lower than 50oF (46oC).